I have a few of each of these Valentine's Day polybags for sale just in time for that special Lego-lover in your life. All are new, sealed bags from a pet and smoke free home. There is easily enough time to ship across Canada and the US before that special day. Shipping is $2 each to the US. Canadian and other interested buyers contact us about shipping or if you are in the GTA consider dropping by. We are currently cleaning out our basement of sealed sets to make room for a reno and would love to share these with others who might have a use for them now. 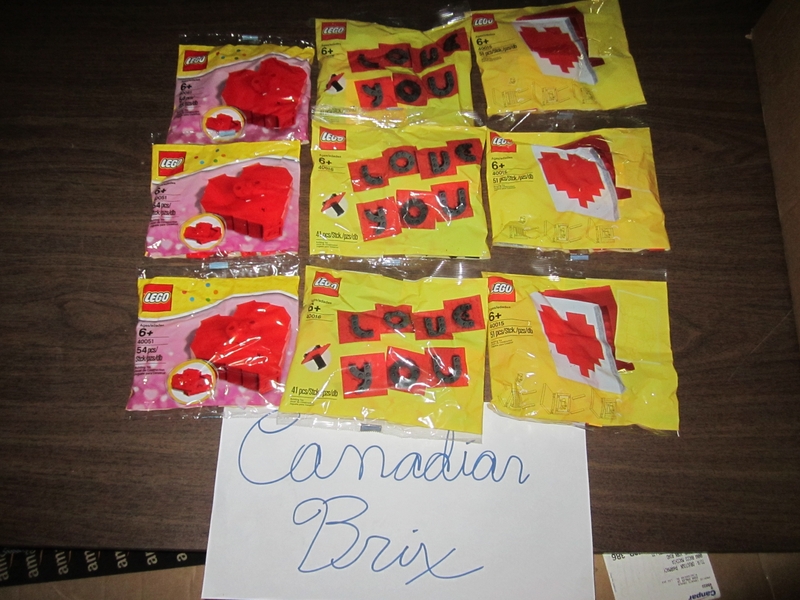 We have sold and traded a few things to local bricksetters via this forum, and are known as kriskobrix on eBay. Forgot to add this photo. Only a few left. Make us an offer for the last ones.